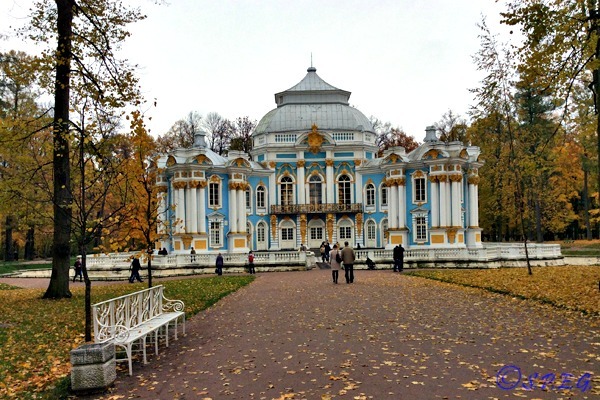 Autumn in St Petersburg Russia | What to See & Do! Find Out Why You Should Come, What to do, and What to Pack! The autumn in St Petersburg Russia is by nature short, atmospheric and beautiful - plus the new cultural city is in full swing. 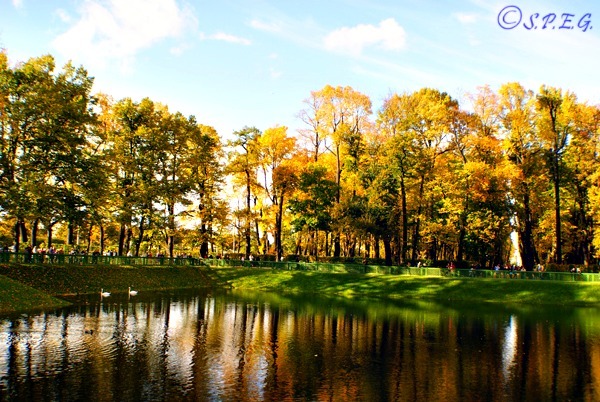 Considered the favorite time of Russian poet Pushkin, the golden autumn, as Russians also call it, is the most colorful and outstanding season of the imperial city. As the fall foliage begins, the trees change their colors, the leaves turn from green to gold and the parks burst with color. A few photos of St Petersburg Russia in Autumn. From the first half of September the weather in St Petersburg is usually quite warm and dry, with average temperatures over +11 °C/52°F. Also, at the end of September and the beginning of October, the city occasionally experiences a meteorological phenomenon, called Indian summer (in Russian Bab’e leto – “peasant woman’s summer”). Basically, it is the equivalent of an Indian summer that brings a week or so of warmth and sunshine. But later the St Petersburg weather quickly becomes dull, damp and chilly, with the first ground frosts. In fact, in October the weather in Russia brings cold and rain along with crisp bronze sunlight; but in return it also offers the most colorful month with red, orange and yellow leaves flying into the air and covering the ground. This is the so called Golden autumn. A real must see! Then, in November the city of St Petersburg begins to freeze again and become dark and cold. At some stage it starts to snow and temperatures plunge down, reminding us that the Russian winter is coming. "Nor spring nor summer beauty hath such grace, as I have seen in one autumnal face" - wrote John Donne, the English poet. Summer Garden in Autumn, St Petersburg, Russia. After the vibrant Summer, the imperial city goes back to normal and starts to get ready for the long Russian Winter ahead. However, if you think that this Russian season may seem the least interesting of the four, we can honestly tell you that you are wrong. Even if the Summer Festivals, fireworks and White Nights are over, and it may be cold and rainy (and since we are talking about Russia - sometimes snowy too), the city of bridges remains a destination for tourists with plenty of things to do and see, although there's less excitement around. So the cultural city of St Petersburg does not sleep during the fall, but rather there are a lot of concerts and classical shows to entertain visitors. 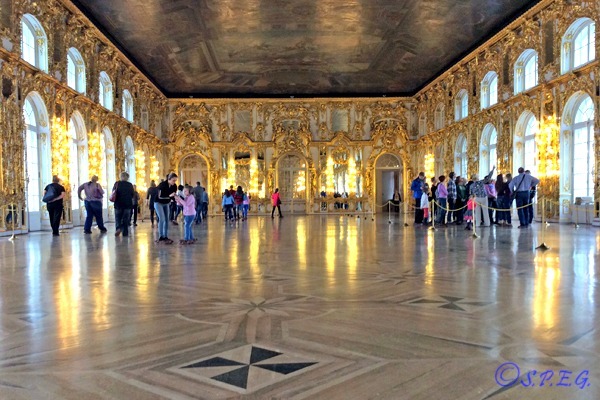 And, since many tourists have already left, all museums and attractions in St Petersburg are less crowded and the average hotel prices and tickets are less expensive than in summer. You can even find a tour guide available at the last minute, although it is always good practice to book a tour well in advance. Also, if you come at this time of the year you are still in time to enjoy a boat trip across the rivers and canals and see the famous night drawbridges in operation - if it isn't too cold and there is no ice on the Neva River. Wondering what to do during the autumn in St Petersburg? You can go for a day trip outside the city, admire the bridges opening at night, or go to the Mariinsky theatre to see the ballet, and much more. For many Russians Autumn is the most favorite time for private parties, receptions, treasure hunts and barbecues. For you it can be the right time to explore the city in a relaxed way and pay less for your stay. 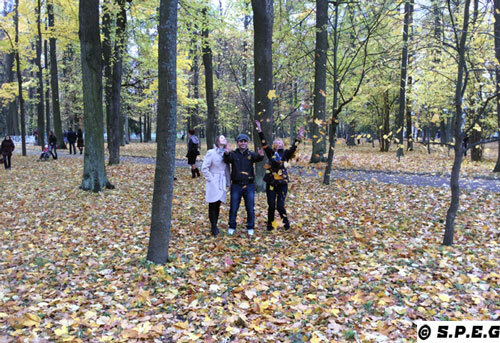 Tourists visiting Catherine Palace in Tsarskoye Selo during Autumn. If you come between September and October, the temperatures are mild and you can do all the activities that many visitors do during the summertime. But if you arrive in November, the first chill and snow might prevent you from doing many of the usual activities. That said, early autumn in St Petersburg is the perfect time to go for a stroll in the beautiful Summer Garden or inside the garden of the Mikhailovsky Palace, especially if you want to have a taste of the golden autumn with its vibrant colors. Alternatively, you can plan a trip to the outskirts of the city to visit the famous imperial suburban Tsar residences such as Peterhof, Tsarkoye Selo, Pavlovsk, Gatchina and Oranienbaum. Or maybe, discover Yelagin Palace, set on its own wooded Yelagin Island. People walking into Catherine Park in Tsarskoye Selo during Autumn. If you come before October, you can still take a river boat cruise on the many canals of the city of St Petersburg and later admire the bridges opening at night, an impressive show. However, if Winter has arrived early in November, don't worry! Instead, just go and spend the evening in a hot Russian banya, try a Russian SPA, or spend a few hours at Peterland, the new Aquapark, where you can try twelve different types of Russian sauna and relax in the swimming pool while looking at the Gulf of Finland out of the window. You will love it as much as we do. Guaranteed! Of course, you should also join a tour group or take a private guided tour to explore all of he sights and attractions of the cultural capital of Russia. And, if you like rock, pop, or classical concerts, visit one of many concert halls in the city. Also, you cannot miss the amazing artistic opera and ballet performances of the Mariinsky and Mikhailovskiy theatres. If you're interested in a private tour, why not take a look at our St Petersburg Tours section. If you are travelling to this Russian city at this time of the year you will need to pack a variety of clothing as in the summer. Early autumn in St Petersburg brings warm and sunny days, especially if you are lucky to come during the Indian summer. So you will need to pack short sleeve shirts and summer shoes, and as rain is never far away in this Russian climate, don't forget to pack a raincoat or umbrella. 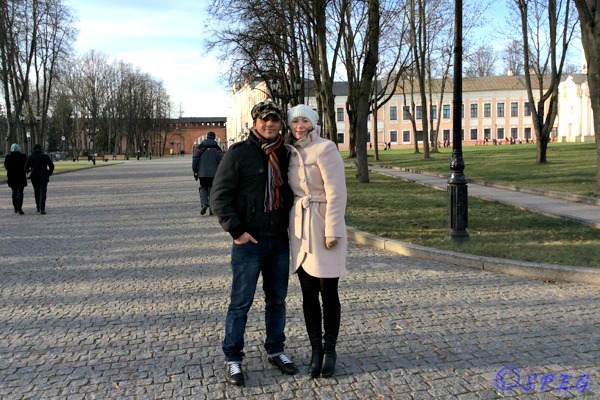 Anastasia and I "Davide" on a day trip in Novgorod during Autumn. As the season progresses (October-November) the fresh north-western wind blows and the temperature drops; so plan for this by packing a warm jacket or coat and a scarf. Warmer footwear will make your strolls along the Neva River and through the picturesque suburban parks enjoyable. Generally, think comfortable boots for walking, plus jeans and a fleece jacket for during the day. In the evenings, if you want to dress up, then women should take tights or pantyhose to wear under their skirts and men will probably require a suit jacket. You should also pack gloves and a hat if you come in November. Honestly, we think that whatever time of year you choose to travel to St Petersburg, you’ll have a fabulous time. If you don't want to feel like you are following the crowd and also want to economize your travel to Russia, Autumn in St Petersburg can be a good time to enjoy the city's world famous attractions, see the famous Russian ballet and try a romantic Russian cruise on the Neva River in peace. You can get better rates at hotels and restaurants, plus avoid tedious long queues in the museums as is less crowded than in the summer. Keep in mind that you can never predict the Russian weather, so bring an umbrella and waterproof shoes with you as it can get wet at anytime. If Autumn in St Petersburg is the season you've chosen, then we recommend you plan your trip to Russia between the end of September and the beginning of October. If you love shopping, and you wish to buy something typical from Russia, then I suggest you go to Gostiny dvor. There you will find a lot of souvenir shops, including a lovely fur shop, and more. From Autumn in St Petersburg return to Weather in St Petersburg or go back to the Homepage.